March 12, 2012 became a historic day for the J-Boats company. 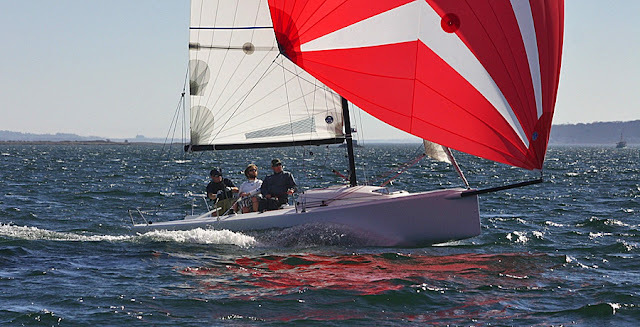 The 1st J/70 hull # 1 made her debut on the Narragansett Bay in Rhode Island on a unseasonably warm day. Eight days later hull #2 made her way into the water and they spent the week in sail trials. Except for one day, the conditions over the five days of racing had been strenuous and exhausting. “It was a fun week,” said Healy. “The nice part is there was wind the whole time; we enjoyed that, but because there’s wind you have to work hard and at this point everybody is tired but also excited at the same time.” This is Healy’s third world championship title as he adds the J/70 title to two he has won in the J/24 class (2013, 2010)….